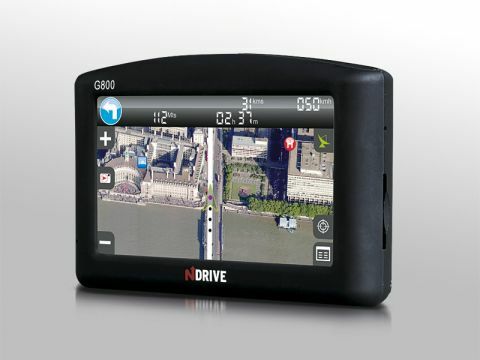 The NDrive G800 is a mid-range sat nav device with a difference. Where all its rivals come with animated mapping, the N-Drive is the ﬁrst to utilise aerial photography, providing maps either from above or from an angle. The G800 offers directions for the UK and Ireland. Getting used to the aerial photography takes a little time, as there's no option of a traditional ﬁrst-person viewpoint. The images are also limited to 29 major cities – outside of which the G800 reverts back to traditional TeleAtlas maps. In keeping with its rivals, we found these clear and easy to follow. A 4.3-inch touchscreen display covers the front of the NDrive, which we found bright and easy to see in most conditions. All functions are carried out using onscreen buttons, with just one hardware button to activate the power. With a Centrality Atlas III GPS chip at its heart, the N-Drive took a relatively long time upon initial startup to locate the necessary satellites. Once the location was pinpointed, however, further use proved a lot quicker. The NDrive features a rubberised ﬁnish, which is tactile and adds a degree of robustness. At 20mm in depth, the G800 ﬁts into most pockets or handbags with ease. It comes with a cradle to attach it to your car's windscreen, and we found this easy to use, if a little bulky. Additional features include an MP3 and video player, and an FM transmitter lets you play back music stored on SD cards over your car's radio. An integrated Bluetooth chip lets you connect to your mobile phone for use as a hands-free kit. If you stick to the TeleAtlas mapping, the G800 is a useful and well-equipped device, although we'd expect to ﬁnd the latest SiRF Star III GPS chip in place at this price. However, its biggest selling point – the GoogleMaps-style navigation – proved trickier than regular animated maps to use when driving.